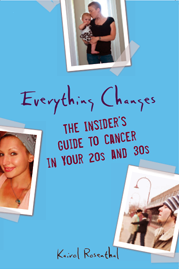 Everything Changes – The Guide to Young Adult Cancer » How To Be a Widow on Myspace? How To Be a Widow on Myspace? “I learned very recently that the term ‘widow’ is not an option on Myspace when selecting a ‘Status’. This really bothers me. I feel that the other options don’t apply to me. So, I need to reclaim the words ‘widow/widower’. I think people are afraid of it/us. Sure, our new status is difficult and comes with a lot of work to do. That doesn’t mean we are some strange, mysterious creature not to be trusted or gotten close to. The word widow means I was a part of a loving, special relationship that ended not by choice but by circumstance. To my friends I say, ‘Believe me.’ When I tell you I’m ok, I’m really not lying or covering up my feelings to spare you the details. Every day is new as I work through this. I have good days and bad days. Some days all I do is smile when I think of my husband, other days I can only cry. It simply means that I am ok. Not awesome, not wonderful, not wallowing in misery. When those times come I hope you’ll be there too, but when I’m ok trust me and let me be ok for as long as it lasts. To the cancer community I say, Don’t ignore me.’ Bereaved spouses have so few resources. Sure, my partner’s story may not be an American Cancer Society commercial waiting to happen, but it’s mine, and it connects me to the larger community of those dealing with cancer in so many capacities. I’m not going to rain on your parade of positivity, nor is my “widowdom” any more contagious than the cancer that put me here. I shouldn’t get kicked out of the club because my story didn’t have the happiest ending. It’s still a story of hope, love, trust and living. If you’re a bereaved young adult, how do people around you respond? If you are a survivor do you ever reach out to widows/widowers or does it freak you out – especially if you are still in treatment? (Come on, be honest.) I think our community often sweeps bereavement under the young adult cancer rug. This needs to change. Do you agree? Wow, What a powerful story you have to tell, to be young and widowed. I have a friend who was widowed at age 40 also due to cancer, I can only imagine the heartache and the sorrow thar you feel and will continue to feel. Since grief is a life-long process, there should never be anyone telling you when to grieve and when not to. When to be okay and when not to. I wish you all the love and caring and support that the cancer community and certainly I can give you. Its funny how such a little thing like not getting to chose “widow” on your myspace profile can get you thinking about things. Your situation seems to affect even the most commonplace, mundane details of being a young person. Thanks to Kairol for posting this. Rick took that picture of me on our second or third date, in Chicago, on the subway. I titled it “a reason to smile again”. Rick will always be my reason to smile. What a great post. Beautiful words. I was widowed 15 years ago when I was 25. Not from cancer but from a car accident. We had only been married a month shy of 2 years. That was back when there was no myspace, facebook, twitter and all those others ways we can connect with others via the internet. It was so isolating to be a young widow. I didn’t know anyone my age to connect with who knew what I had gone through. The people around me began to treat me differently. It was as if I had some disease they didn’t want to “catch” but I think it was that I became a reality check to them. If it could happen to me then…maybe it could happen to them too. Then 7 years later, at 31 I was diagnosed with breast cancer. I figured it had to be a joke! But there I was again feeling like I was so isolated as a young adult with cancer. Again, I became a reality check for those around me. Then I heard “Poor Cathy, now this…” I tried my hardest to ditch the pity parties and move on with my life as I had before. I knew that if I could survive losing my husband I could survive cancer. Today I am married again to a man I met during my chemo treatments. I never expected to find love again and certainly not during cancer! Charissa, thank you for sharing your feelings. I am sure you will inspire many others with this post. I wish I had known someone like you back when I was a widow. And man did I hate that word! To me widows were old ladies who had already spent a lifetime with their men. And they were dressed in black ALOT and never married again. Kairol, thanks for introducing us to Charissa! when rebecca’s father died, at 36 from the same cancer that she now has, I had no frame of reference for my new status. (1986) in my circle at that time, the only people who I knew that died besides peoples grandparents, were people who O.D.’d or died in a car accident. so not only was I isolated in the “widow” way, I was also a reminder to a group of people that there were “grown-up diseases out there and that, yes, this could happen to you. I was left with 3 small kids and no clue how to face that future alone. now, with rebecca having the same horrific disease that took her father, I find myself re-living parts of that nightmare that I never dreamed I’d experience again. the widow thing got to be something I could use for shock value when I needed to. married friends vanished or the husbands came around to see if I “needed” anything, euphamasticly speaking! I found my own way through widowhood in the same way I am finding my way through our current nightmare. some things just aren’t fair! mary babcock..rebecca babcock’s mom. What a powerful and well-written post and story. I am the spouse and caregiver for a young adult cancer patient and conversations about widows/widowers do not freak me out. While it would be more than crushing to lose my spouse, I don’t see the point of trying to avoid thoughts or discussions of widowdom. It is a reality in life that we must accept and figure out how best to deal with, rather than avoid. Charissa I am so blessed and proud to be your friend! Eloquent post. I agree completely with the need to integrate widows/widowers in the survivorship community. Some people tried to discourage me from writing about life after the death of a loved one to cancer, telling me it would hurt my work on survivorship. They are so wrong! Death is part of survivorship, and I want to offer information, advice, hope and humor through ALL of survivorship. I want people to feel seemless love and support through whatever life has to offer, including death. Our culture does quite a bit of hiding. It is getting better more quickly regarding illness than death. Thank you for sharing your thoughts, your process and your words, Charissa. And thanks to Kairol for giving you the space to do so. Your piece resonated with me and my experiences as a widow for two years now (or young adult cancer “surviving spouse”, as I sometimes prefer to say). Mike was in constant treatment for Hodgkin’s for over eleven years so, like all diagnosed and partners, we were forced to deal with tough issues throughout. Widowdom was no different, except for the major fact that I was doing it alone, missing Mike immensely. I found that the more open I was to discussing it, the more accepted and encouraged I was into groups of people where the disease still looms. One of the hardest things I had to do was tell a group of fellow cancer couples who had attended the inaugural Planet Cancer couples retreat (just three weeks prior) that Mike had died. I was so scared to tell them that the vital, life-loving yet obviously physically debilitated man they had come to love and admire was dead, just after they met him. Of course, they’d had to face their mortality with their diagnosis, but I felt like I was slamming it in their faces. Their response to me was amazing and, luckily, taught me about the resilience of others and support they provide when I continue to be active in the cancer community. In fact, I’m actually a more active cancer awareness advocate now than was when Mike was alive. I was doing all I could to be his advocate—ensure he had the best tx, the best care, all the options available—in addition to enjoying what time we had together. Plus, I felt like cancer was more Mike’s story and let him take the lead on how involved we were. However, being a young adult widow is my story, solely but with the background of our experiences, which has surprisingly freed me up to be much more active in the cancer community. And those I have been involved with, to their credit, have welcomed my participation more than I ever expected. I still hesitate sometimes when my worrisome personality thinks I’m being a “downer”. But, as I’ve been assured by a cancer superhero, this is a part of the reality those affected by cancer face everyday. Until there is a cure or survivorship is 100%, there will continue to be more of us dealing with the death of our loved ones. My hope is to be a support when that happens and an example to others that you don’t have to be anything other than what you are. And, among many other things—advocate, night owl, Coke Slurpee addict, artist—I am a young adult surviving spouse, widowed by cancer. To this widow, and to so many others, having that status doesn’t necessarity define us, but it sure goes a long way toward more accurately explaining our unusual situation. I am not embarassed by my Widowed status, and I wonder why that offends people. Monica, Thanks for the update about Widowed being added as a facebook status. If there statement were true that being widowed really does not matter in the global scheme of things, then I think I’d have to switch globes to a world where it does matter. I can think of few things more profound than the death of a loved one. I wonder if it scares people more so than offends? Any communities for young, Jewish women caring for severely sick spouses? And relatively young? In my book Everything Changes I write about a website called youngcancerspouses.com. Check them out and see if there are others on their discussion board who might be in a similar situation as you. Speak with a chaplain at your hospital or a hospice, and/or your rabbi. They might know of resources specific to your geographic location that support Jewish people through healing experiences. Imerman Angels is a great organization that does one-on-one matching for patients, families, and caregivers facing cancer. What I like about them is, unlike other organizations that just match by disease type, Imerman Angels takes into consideration so many other life factors such as age and likely religion. Give them a call and see if they can make a match for you. They are like the yentas of the cancer world. Cancer Care is a national organization that is based in New York City. They have online and phone support groups. In the past they have had groups for young adult caregivers. Given their New York location, I’d say there is a greater chance of connecting with other Jews through them than if they were located in, let’s say Nebraska. I hope this is somewhat helpful. Feel free to contact me directly if I can be of support to you in any other way.